Is your space a little too tight for a full-sized Christmas tree? Do you dread the thought of lugging a seasonal evergreen up those narrow apartment or condo steps? Does the thought of vacuuming up all those pointy brown needles and disposing of the debris when the holiday is over provoke panic attack? Do you prefer a living decoration instead of chopping down a tree for a temporary ornament, but you don’t have anywhere to plant a larger pine? Fear not, a Norfolk Island pine may be the solution. Norfolk Island Pine, Araucaria heterophylla, is a South Pacific native and makes a wonderful stand-in for the traditional indoor Christmas tree. This evergreen houseplant is smaller in stature with soft, lush, deep-green needles borne on graceful branches. It may be decorated with a strand of mini-lights and seasonal bows and enjoyed long after the holiday has passed. Caring for this plant is easy, and with proper care you can enjoy your mini-pine long after the holidays end. Place your Norfolk Island Pine in bright but indirect light. Turn the plant a quarter turn each week to help it grow straight and prevent it from leaning in the direction of the light. Feed your tree with an all-purpose, balanced fertilizer labeled for houseplants once a month during the growing season. Allow the plant to rest from fertilization during the winter months and resume again in the spring. Water when the top inch of potting mix feels dry. Allow all excess water to drain from the bottom of the pot (a drainage hole is essential). Be careful not to overwater or the roots may rot. Humidity is important for a healthy plant, and is greatly reduced during the winter months when the heater is on. Running a humidifier, placing your plant on a humidity tray and grouping your houseplants together will all help raise the humidity level in your home to protect your pine. Never prune your Norfolk Island pine. It will ruin the shape of the plant. The exception is if branches are damaged, but only trim as little as possible. Replant when your plant outgrows its current pot, choosing a new pot that is just slightly larger than the old pot. While these trees have a distinct pine look, their small size and delicate branches cannot withstand great amounts of classic Christmas tree decorations. Instead of heavy bulbs and bulky light strands, use mini-lights and LED strands. Opt for miniature ornaments, thinner garland strands and other tree decorations sized for smaller trees to create a beautiful look without the tree seeming overwhelmed and without risking damage to the tree. A small tree skirt can help conceal a pot, and you can also hang additional ornaments or garlands from the pot itself. 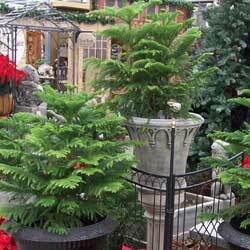 Stop by and choose from our selection of Norfolk Island pine for this year’s Christmas tree or for holiday gift giving. We also carry a great variety of other holiday plants – succulents, bulbs, and more – ideal for gift giving.